ZOTAC this week plans to start sales of its VR GO backpack PC designed for virtual reality enthusiasts. The system uses a quad-core processor from Intel, and is equipped with NVIDIA’s GeForce GTX 1070 graphics processor and comes with I/O capabilities, just like any normal desktop. The manufacturer plans to sell only fully configured VR GO backpacks for $1999, but the PCs can be upgraded by end-users themselves in a bid to meet their requirements. ZOTAC formally introduced its VR GO backpack PC earlier this month, but kept the final specifications under wraps. This week, the company revealed that the system will feature Intel’s Core i7-6700T CPU, NVIDIA’s GeForce GTX 1070 GPU with 8 GB of GDDR5 memory (MXM module), 16 GB of DDR4-2133 RAM as well as a 240 GB M.2 SSD with PCIe 3.0 x4 interface from an undisclosed supplier. End-users can then upgrade the VR GO machines with a 2.5” SATA SSD (obviously, nobody wants a hard drive in a backpack PC due to extreme failure risks) as well as install up to 32 GB of DRAM. In theory, the CPU and the GPU could be swapped for higher-performance parts, but since the proprietary low-profile air cooling system was designed with the particular components (the i7-6700T and the GTX 1070) and TDP (150W) in mind, such upgrade would be considerably trickier. 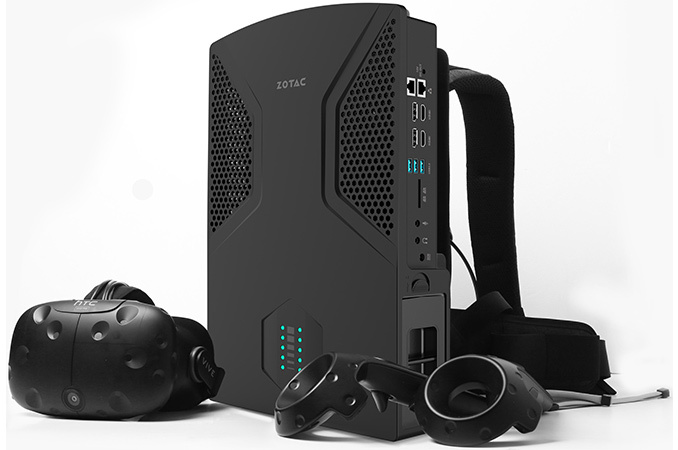 Meanwhile, I/O capabilities of the ZOTAC VR GO are clearly worth a mention as the system has an HDMI 2.0 output as well as two USB Type-A ports on top to connect a VR headset as well as four additional USB 3.0/3.1 Type-A ports, four display outputs (two HDMI 2.0, two DP 1.3), an 802.11ac Wi-Fi + BT 4.2 module, two GbE ports, an SD card reader as well as two 3.5-mm audio jacks. The ZOTAC VR GO can work autonomously for two hours (obviously, the figure depends on applications used) on two Li-ion batteries rated at 95Wh (6600mAh). The batteries can be hot-swapped and charged separately. When not in use as a backpack to play virtual reality games, the VR GO can be used like a normal desktop computer: its form-factor allows it to be placed on a desk either vertically or horizontally and all the ports will remain accessible. ZOTAC will sell its VR GO backpack PC with Windows 10 Home for $1999 in the U.S. The MSRP of the system is similar to the price of MSI’s VR One backpack computer that became available earlier this month. Each system has its own set of peculiarities, which is good as we see a competition in an emerging segment. For example, ZOTAC’s VR GO for $1999 has the GeForce GTX 1070 GPU, whereas a comparable MSI’s VR One 6RD comes with the GeForce GTX 1060. On the other hand, MSI’s machine has a Thunderbolt 3 port and comes with Windows 10 Pro, whereas ZOTAC’s backpack has a desktop-friendly form-factor and more I/O ports, but uses Windows 10 Home. 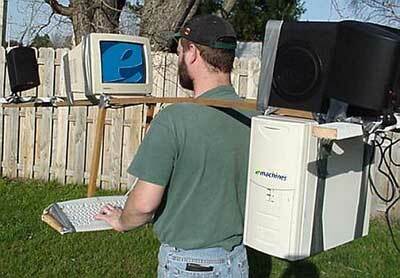 To sum up, VR enthusiasts now have at least two models of backpack PCs to choose from. Meanwhile, both are quite expensive for niche PCs. The idea is two-fold, I think. First, cables get in the way (and wireless latency is too high). When you're constantly having to avoid tripping on them, you're distracted from the game. Of course, you're trading that for a not insignificant weight on your back. Secondly, theoretically there are experimental game/production ideas that could involve larger room spaces that would make cabling even more problematic or impossible. It could fill an interesting niche. On a side note, it could be nice for LANs too, as infrequent as they've become.